What role plays technology in history? Isn’t it interesting that technology seems to have quite a hard time to find its place within the course of history? I guess we all agree that it plays its part. In the historical narratives of our time, however, religion, economy, and politics are portrayed as tightly knit while technology remains outside. This struck me again when reading about a book discussing the making of the 21st century reviewed by the political scientist David Runciman (see picture above or read his text here in the LRB). In the review, technology, this staggering force of the 21st century, is absent, and its absence isn’t noticed. This isn’t a mistake of the author(s) rather than an interesting flaw in the discourse we live in. The book and its review are also interesting for another reason: “Strange Rebels: 1979 and the Birth of the 21st Century” weaves together five overlapping stories – of Thatcher, Deng Xiaoping, Ayatollah Khomeini, Pope John Paul II, plus the invasion of Afghanistan. All these stories illustrate how the myth of the secular process of the 20th century starts to unravel with the return of the two forces markets and religion “that the 20th century was supposed to have seen off”, as Runciman puts it. Runciman’s reading of this book about the beginning of the 21st century addresses again and again a specific point: where to locate historic change. In detail his critique may be right or wrong (disclosure: I haven’t read the book by Christian Caryl), but his examples make clear that contemporary historic change is caused by a shift rather than by an event. This observation might sound banal. However, it has some serious consequences: it changes the role humans have in history. Let me give you one example: when Runciman questions if “elections are what matters in democracies”, he doesn’t question the democratic system – it’s not that easy. Instead, Runciman investigates at what point exactly historic change happens, and comes to the conclusion that elections rather mark the outcome of that change. Let me add to this observation another point he makes, the one that our history is often shaped by forces which do not stand for election. Runciman discusses this in his review, when he talks about the acceptance of 1980s-style financial politics which allowed unemployment to skyrocket while bringing inflation under control. A striking observation. Isn’t it that today the public is again taking part in a similar shift i.e. the always soon to be over financial crisis? Again we find the same reaction: the collective shrug. Regarding the financial crisis, we seemed to have learned not a lot from our recent history. On the other hand we might say, we don’t really yet know our role in a history that shifts. How do you oppose a shift? To get us thinking about this is what makes Runciman’s text crucial. Today, we live in times in which the world seems too complex a thing to be changed by one individual – regarding individuals, we talk about celebrities but not anymore about heroes who change the course of history. By now, flat hierarchies seem to have reached the political movements of our time – at least in the reporting of events from the Arab Spring to Occupy or Taksim Gezi Park hashtags are more influential than individual voices. They illustrate that next to collective shrugs we still know how to collectively protest. However, the outcomes also make apparent that protest isn’t changing the course of history enough. If technology gives an external appearance to what is collective, as Paolo Virno has said in a Radical Philosophy interview following French Philosopher of Technology Georges Simondon, then maybe technology can help us to find a way to influence a shifting history. With this, it would also find a new historic place. 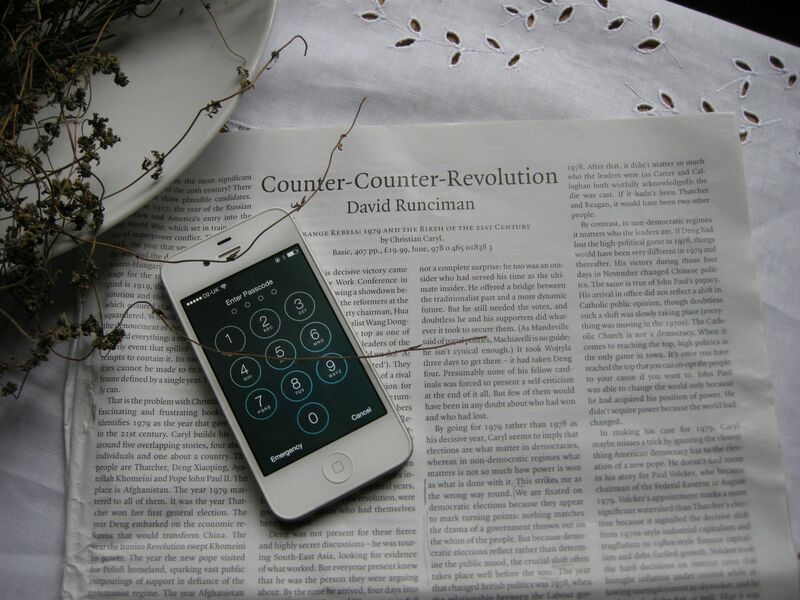 David Runciman 2013, ‘Counter-Counter-Revolution. Strange Rebels: 1979 and the Birth of the 21st Century by Christian Caryl’, in: London Review of Books, Volume 35 No. 18, 26 September 2013, 3-6. Virno, Paolo 2006, ‘Reading Gilbert Simondon. Transindividuality, Technical Activity and Reification,’ in: Radical Philosophy, Nr. 136, March/April 2006, 34-43. ← Is reading now labour?